Three of my Grandchildren are in Summer Camp for 7 weeks, and even if they never manage to send notes to us, I still write to them weekly. 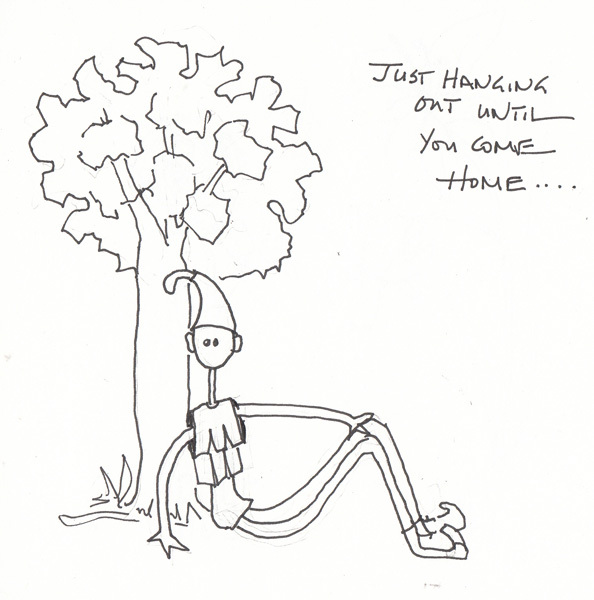 Last summer, as part of a Sketchbook Skool homework assignment, I sketched an imaginary character that I named Axel. Several of my grandchildren played a role filling in the back story and deciding on a name. Last summer I added a drawing of Axel to my letters. This summer I'm adding drawings on the envelopes. This was the first drawing added to the envelope. This is the drawing I made for the second set of letters, and a photo of one of the envelopes. 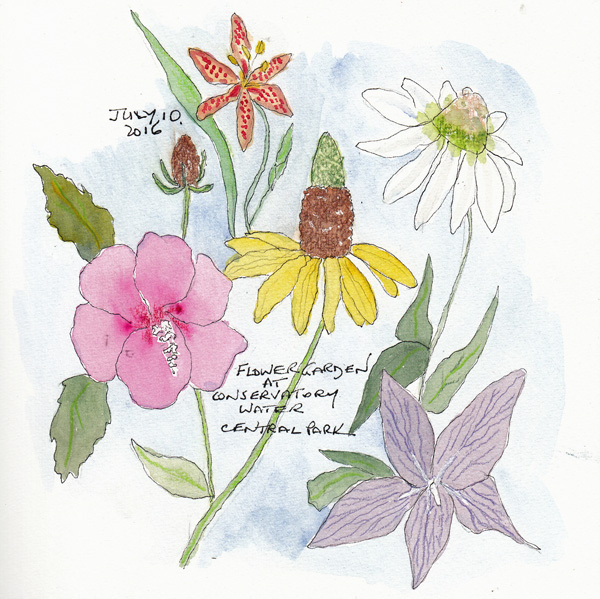 Although I don't enjoy painting landscapes, I love drawing and painting individual flowers. 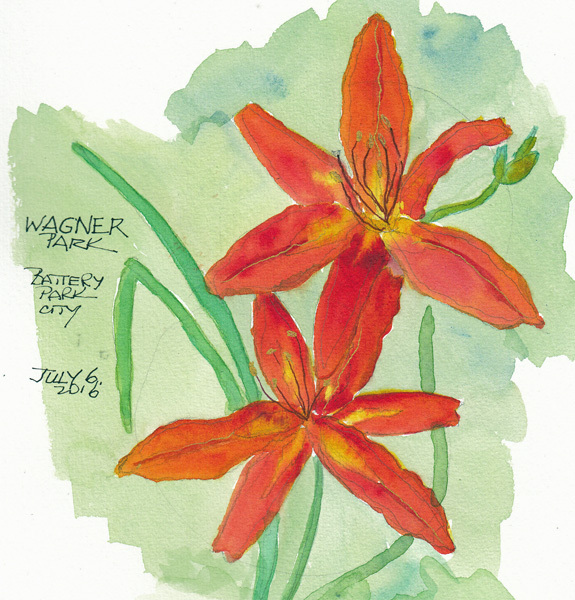 The lilies were painted at Wagner Park, in Battery Park City last week. I loved the colors! This is a selection of flowers growing in Central Park, near the Toy Boat Pond Café (Officially called the Conservatory Water). My husband and I have coffee at the café early on weekend mornings, and I take a few minutes to draw and paint the flowers when we're there. I recognize variants of cone flowers, but don't know the names of others. 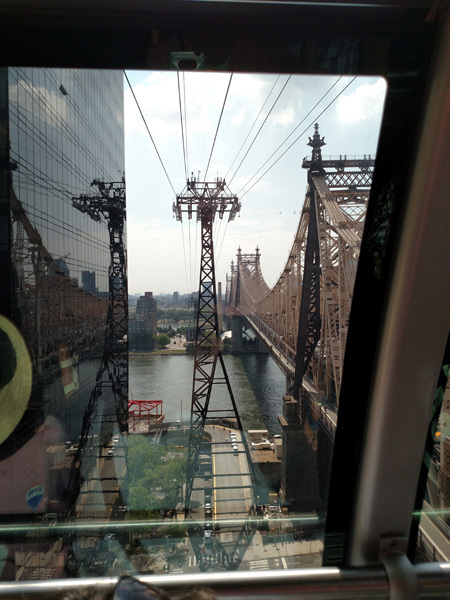 Yesterday our NYC Urban Sketchers Weekday Group took the Tram over to Roosevelt Island. 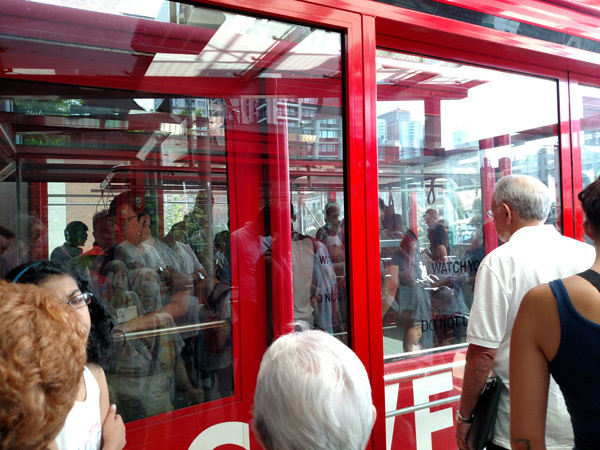 We met at the Tram station on 59th Street, and for me it was my first time on the tram. It is a short ride, but I never get tired of seeing the density of buildings and the Manhattan skyline from all positions and angles. Here are a few photos taken. 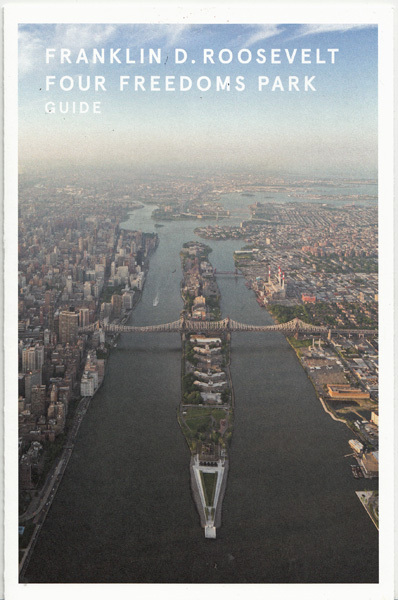 The FDR Memorial Park is the triangular area at the bottom of the Rossevelt Island photo. On the tram approaching the East River and Island. 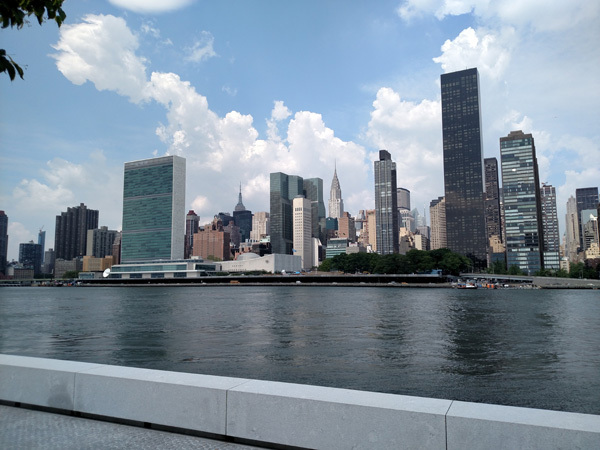 Our goal was to walk to the south end of the island to visit the FDR Four Freedoms Park, but I was immediately mesmerized by the skyline and chose a point of view from the UN to the Chrysler Building for my sketch. 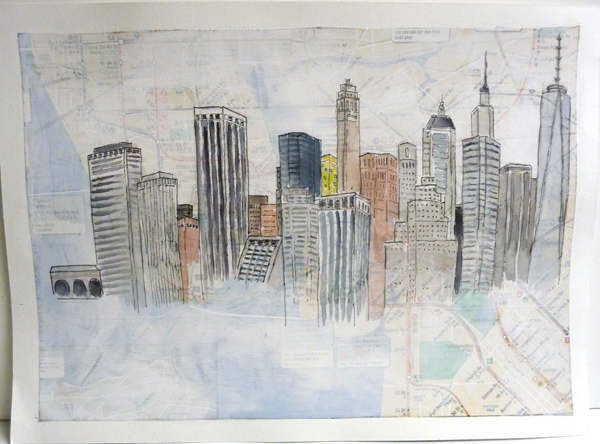 Two years ago I sketched the Manhattan skyline from the Brooklyn Promenade using an art technique I love. I randomly collect tourist maps of NYC - great tourist/map booths are in Grand Central Station and near Pier A in Battery Park. I collaged a portion of the map to watercolor paper, brushed Golden Absorbent Ground (white) over the map and allowed the map to lightly peek through. When it was dry, I packed it up for our trip to Brooklyn painting the skyline from the Ferry Terminal to the WTC1 Freedom Tower. 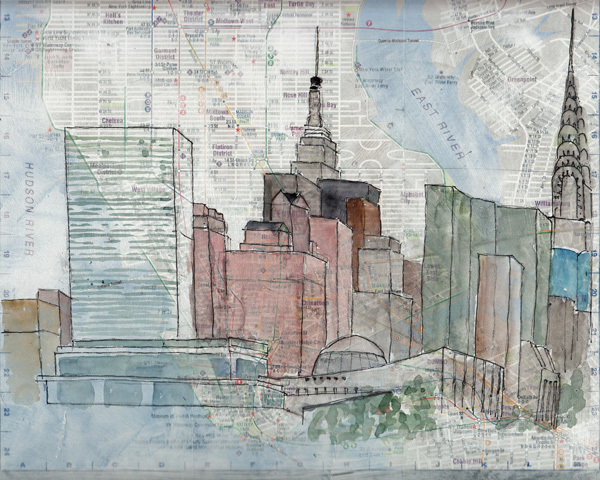 And here is my painting from Roosevelt Island - from left to Right - The UN, the Empire State Spire, and the Chrysler Building. Figure Al Fresco - The Battery Park City Summer Adult Art Program: The model was well known to us, and we politely asked him if he could take off his baseball cap and socks! It was a great improvement. 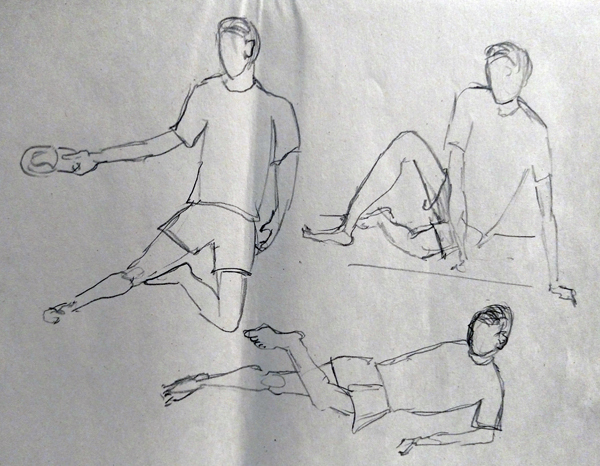 These are several of my 2 minute sketches, done with an 8B pencil on newsprint. Everything in this blog post was photographed because of the paper size. Five Minute Poses: These longer poses were drawn with a soluble graphite pencil and then "shaded" with a waterbrush with clear water. 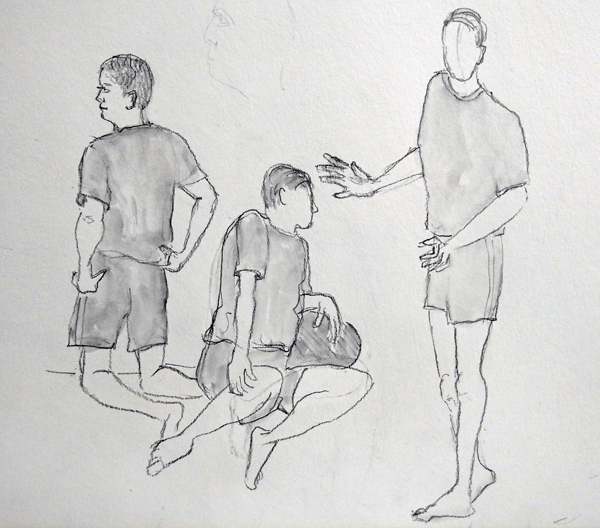 Ten-Twenty Minute Poses: I rarely can sustain my interest for more than 10 minutes, so I filled in the time by drawing another artist behind John in these two poses. The artist drawn behind John, on the left, has a hat on with a huge brim keeping the sun out of her eyes. Wednesday and Thursday were terrific art days this week. 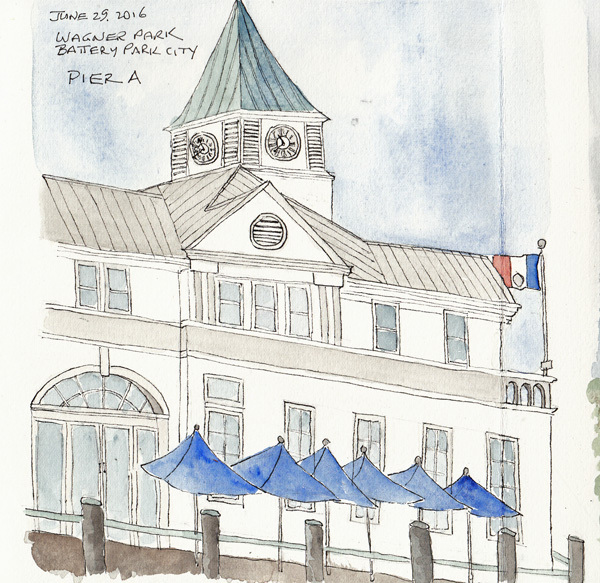 I went to Battery Park City Wagner Park for part of the morning session on Wednesday, and painted yet another view of Pier A. I love the building and really enjoy the challenge because of the multiple perspectives. 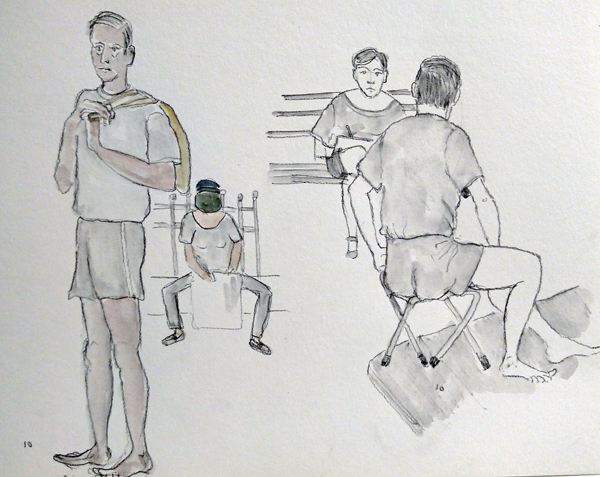 In the afternoon I joined friends for figure drawing in South Cove - another one of the Park's art activities. I haven't photographed the sketches yet. 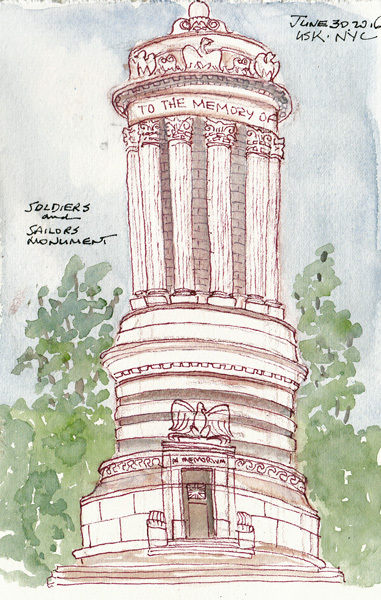 Yesterday I joined a small group from the Weekday Urban Sketchers group - first at Riverside Drive and 93rd Street, and then further south at Riverside Drive and 89th Street. There was shade and a wall or benches at both locations, and a breeze off the Hudson River. We had a delightful time drawing and talking at both locations. 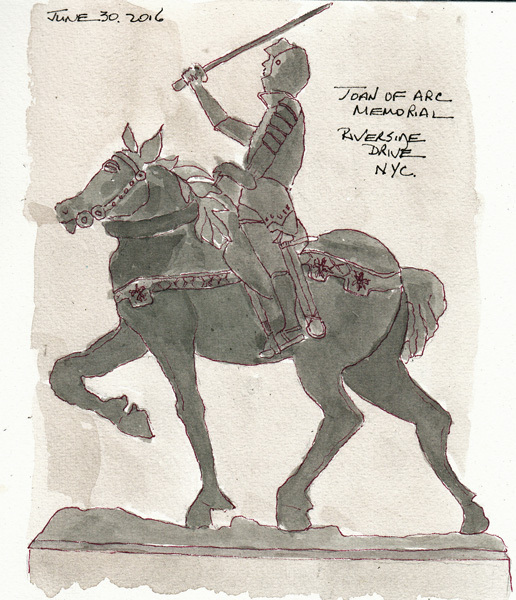 Joan of Arc: Riverside Drive at 93rd. This is one of only 5 statues commemorating women in all of NYC. 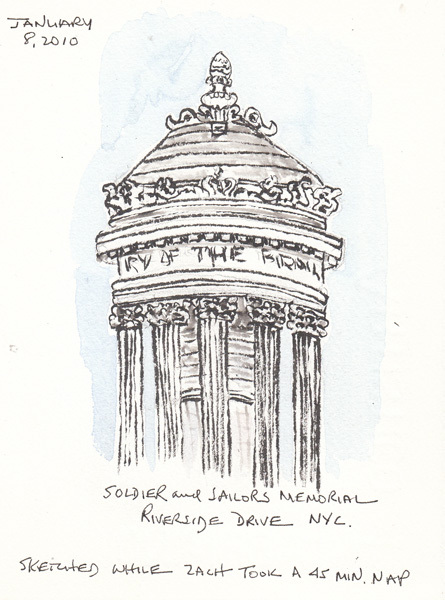 Soldier and Sailors Memorial: Riverside and 89th St. My daughter owned an apartment overlooking the Memorial, and now my son owns it. 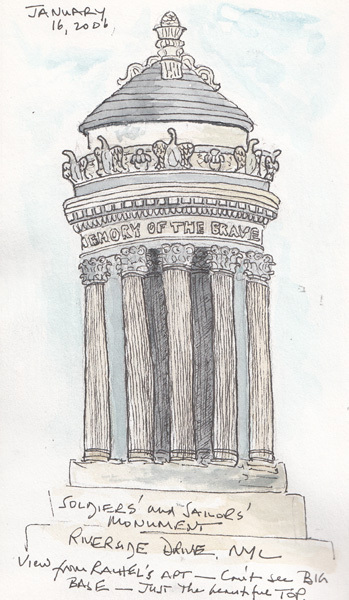 I've had experience drawing the top of the Memorial from their window while my grandchildren were taking naps. My first drawing was in January 2006, almost when I started drawing and painting regularly. And it was the same month I started my blog. In 2010, when my son's boy Zach was taking his nap, I sketched the top again. I remember being disappointed that 4 years of daily drawings hadn't changed my style very much. Yesterday I sketched and painted the full Memorial from a bench on the plaza. It was much harder than just painting the top layer! Many times I've been with one or more of my 6 NYC grandchildren while they rode their bikes and scooters around the large plaza, so this was a real memory drawing for me!